It always disturbs me tilling the entire garden just to plant a few rows of vegetables. 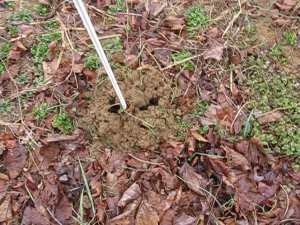 Here we have a settled environment of soil and creature, and I come blowing through with several horsepower and upset all those worms in front of their tiny big screen TV’s. How would you feel? So I have built this micro tiller. It attaches to an electric drill and tills a hole six inches in diameter. The soil is loosened locally and readied for seed planting, and I’m not disturbing the whole of Wormville just to plant a few squash. Take a look at the photos below. 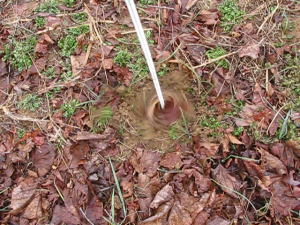 In decent soil, you can drill down a foot easily. The soil is totally loose and ready for mixing in some compost and planting. Here are a couple pictures of the tiller. 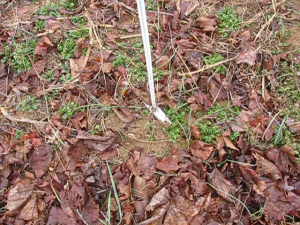 It is constructed using a 3/8 inch diameter threaded rod, and a piece of strap steel six inches long by 1-1/8 inches wide. It was twisted in a vise to make it draw into the soil as it turns. I sharpened the leading edges a bit on a grinder. 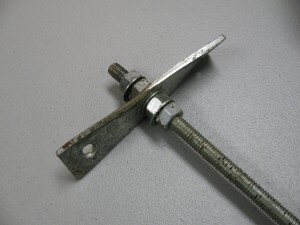 The blade is held onto the threaded rod using four nuts and lock washers. Tighten securely! 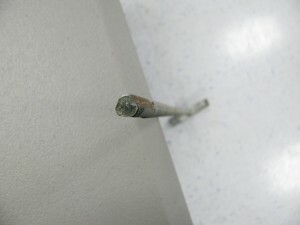 The far end of the threaded rod was ground with three flats to fit the typical drill chuck. That’s it! Your worms will love you for it.